Philip Kappel was born in Hartford, Connecticut, in 1901, and graduated from Pratt Institute in Brooklyn, New York, in 1924. Three years later he was admitted into Who's Who in America, the youngest individual ever listed. For many years he was employed as an artist by the major steamship lines in the United States, such as, the Columbia Line, American Export Lines, and the Cuba Mail Line. His artwork became a record of shipping, past and present, forming a fascinating collection of the ships and men who sailed them. His technique showed the hand of an illustrator's pen and ink, bold strokes were used for emphasis and clarity of design. At other times he used combinations of light and dark, forming silhouettes, which he learned from the marine artist, Philip Little, while spending summers in Salem, Massachusetts. This silhouette style can be seen in some of Kappel's drypoints, and his illustrations for C.W. Taussig's book, Rum, Romance, and Rebellion. Kappel received many awards for his work. 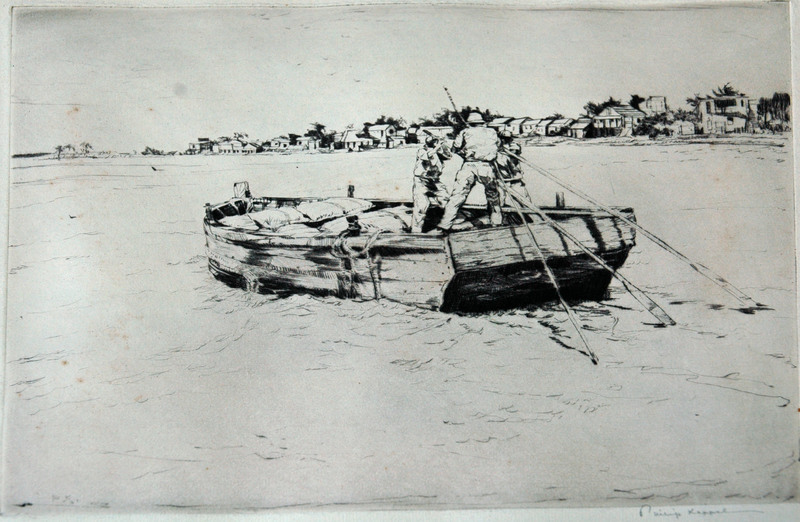 The Bijur Prize, Brooklyn Society of Etchers, 1926, for the print, "Repairs." In 1946, "Off El Morro, Puerto Rico," received a Purchase Prize in the First Annual National Art Competition held by Associated American Artists, New York. First Prize for, "Winter Tracery, New Milford Green," Arts and Crafts Association of Meriden, 1950. First Prize for, "Sugar Maples in Spring, Kappel Residence," Meriden Art Association, 1961. He was the author of several books, the most noted being, Boothbay Harbor-A Portfolio of Sketches, 1924, Louisiana Gallery, 1950, Jamaica Gallery, 1960, and New England Gallery, 1966. The last showing a fond appreciation for his New England heritage, containing 131 drawings and text of the areas most intimate and cherished places. Not only was Kappel recognized for his graphic artwork, but also as an authority on Chinese porcelain, Japanese art, and American and English antiques. He has written and lectured extensively on these topics. In finalizing the works of Philip Kappel, one must state, he honestly and directly recorded the sailing vessels and steamships bound for various ports of call. The men and ships sailing these waters were depicted in the rich burr of drypoint, capturing bright sunlight on paper with open white spaces. His romance with the sea and man's struggle with its elements and quieter moments were fulfilled. Kappel, Philip, “Casting Off,” Westport Public Schools Digital Collections, accessed April 25, 2019, https://collections.westportps.org/items/show/1225.